Two teams are currently competing in an unofficial race for the first human parachute jump to reach supersonic speeds in the descent. The current record height for a high altitude jump is 31.09 km (102,800ft), achieved on August 16, 1960 by Joe Kittinger, a retired United States Air Force Colonel. During his drop he reached a top speed of 988km/h (614mph), just below the speed of sound. But it looks like we are soon going to see the first parachute jump that breaks the sound barrier 1083km/hr (690mph). In the Red Bull Stratos effort Felix Baumgartner (pictured left) plans to jump from a balloon at 36.58km (120,000ft). The team boasts a very nice website and an all-star project team. Oh, and don't forget the sponsorship of Red Bull, a brand well-known for associating itself with high-profile sports, extreme sports and record-breaking efforts. Another well-known brand, Nokia, is also providing a special application for its handsets that will enable the public to watch the event in real-time, even showing Baumgartner's pulse rate! In parrallel, another effort by a team consisting of French and Canadian members is preparing for Le Grand Saut (The Big Jump). In this effort, Michel Fournier (pictured right), a former colonel and paratroops instructor in the French army reserve will attempt to jump from a balloon at 40km (~130,000 feet). Le Grand Saut doesn't appear to have any major sponsors but it also has some quite impressive members from the medical sciences. Le Grand Saut is planned for May this year whereas Red Bull Stratos has not announced the date of its attempt. 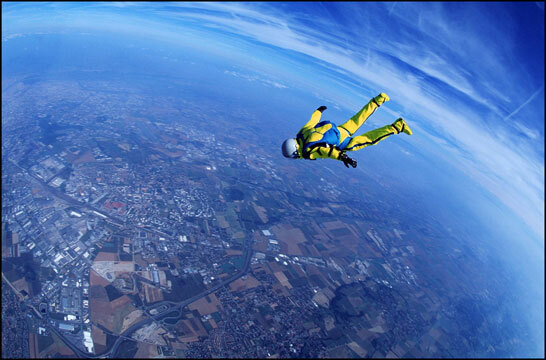 Parachute jumping from extreme altitudes is not just a publicity stunt. It also has important benefits for many other fields including medicine, science and technology. These types of extreme altitude parachute jumps can also simulate the ejections of astronauts from a high altitude rockets, quite important in this age of human sub-orbital spaceflight. Scroll down this post to see a promotional video of the Red Bull Stratos effort as well as a nice picture and two CNN news pieces about a previous attempts at Le Grand Saut.